The Small Game Program within the Alaska Department of Fish and Game (ADF&G) is responsible for monitoring, managing, and addressing research questions for all species of grouse, ptarmigan, and hare in Alaska. Due to limited resources the program has primarily focused on those species and populations that reside near the primary Alaska road system. 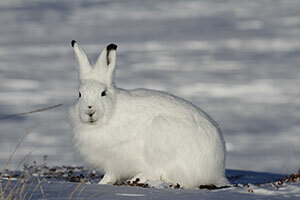 As a result little is currently known about species and populations throughout western and northern Alaska particularly Alaska hare (Lepus othus). Despite the popularity of Alaska hares by recreational and subsistence hunters throughout western Alaska ADF&G has a very poor understanding about current distribution, abundance, and basic life history traits of this species of hare. Many rural residents along with local area ADF&G biologists have expressed concern over perceived long-term declines and generally low abundance in areas that historically had higher numbers of Alaska hares. The Statewide Small Game Program is asking for your help in making field observations of pellets or actual sightings of Alaska hares throughout western, southwestern Alaska, and beyond. 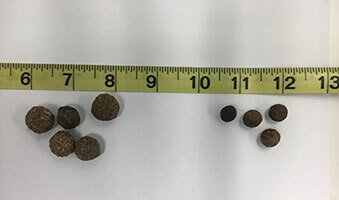 Alaska hare pellets (left), vs. snowshoe hare pellets (right). You may also enter GPS coordinates in this field if known.